Haven't read the Terms and Conditions? Well you should! New Electrum Gold Standard Stencil Primer is taking the tattoo industry by storm! Electrum Supply has a three (3) business day guarantee! Most orders ship same day if placed before 3pm EST. We promise that your order will ship within three business days! If your order does not or cannot ship within those three business days, we will contact you in order to rectify the situation and get your order out as soon as possible. Professional accounts who are assigned a specific rep. will be contacted by that rep. Web orders (orders placed on our website) will receive an eMail from our Web Dept. Please take this into consideration when you are placing your order. Orders are shipped in the order they are received. Your expedited shipping simply means that once it leaves our warehouse, it will ship in the manner in which you paid for. When checking out, your shopping cart will always present you with available options based on your location. 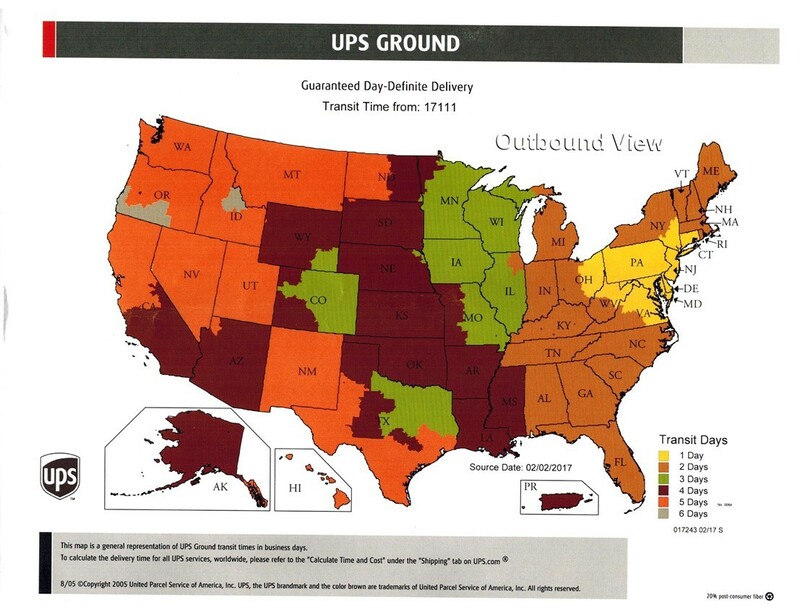 The map below will give you an idea of how long UPS Ground will take to reach you from our location in Elkhart, IN 46516. Please note that packages shipped via UPS are automatically insured for $100 USD. If you would like to have your package insured for more, please contact us. Click the map image for a larger view. Please note that USPS First Class offers no insurance. Any orders over $25 should be shipped via UPS in order to insure against loss. We do not control delivery times for any of the above services. We can certainly make a notation on your shipping label to deliver at certain times, but neither services is obligated to follow such requests. If you own a business, please make sure that your business hours are posted. That is the only thing UPS drivers are obligated to follow. USPS drivers are bound by neither special requests or posted hours. UPS will not deliver to PO Boxes. Please consider using USPS if you need to have a delivery sent to a PO Box.